Fitbit pedometers are popular tools for tracking health metrics. The newest version, The Force, has a couple of nice updates but is not much more impressive than its predecessors, The Flex and One. 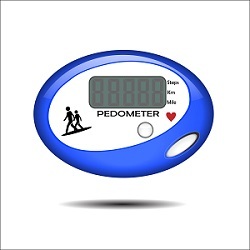 These pedometers are worn on your wrist like a watch and hold all of the necessary technological equipment to track a large number of data points. With your Fitbit pedometer, you can keep accurate tabs on your sleep cycles, your step counts, the flights of stairs you ascend and descend, your eating habits, your workouts and more. The Force has a new OLED screen, which makes it easier to read and see in sunlight compared to the previous LED screens. As a step counter, this tiny piece of technology is solid, waterproof, long lasting (up to 11 days between charges), and rarely in the way. The Force is actually 25% larger than The Flex. It comes in two colors; a matte black and dark blue. Overall, the amount of information that these small Fitbit pedometers are able to handle is incredible. The handy device makes keeping track of progress and setting and reaching goals easier and more realistic. Wellworks For You has partnered with Fitbit to deliver to its clients the most customizable and comprehensive pedometer programs available on the market. These top of the line wireless devices sync directly with our web portal to allow users to view their progress and stay motivated in their Wellness Program. In addition, satellite imaging and graphs provide in depth information on users’ progress, and geographic trekking areas. If you are looking for a fun and easy way to set some exercise goals and actually reach them, Wellworks for You’s pedometer programs may be just the ticket. To learn more about this program or any of our other offered services, please do not hesitate to contact us today. We look forward to aiding you in your quest for overall wellness.